On August 8, 2017, Kip Koelsch published his debut novel, the eco-thriller Wendall’s Lullaby for Kindle and as a print-on-demand paperback. 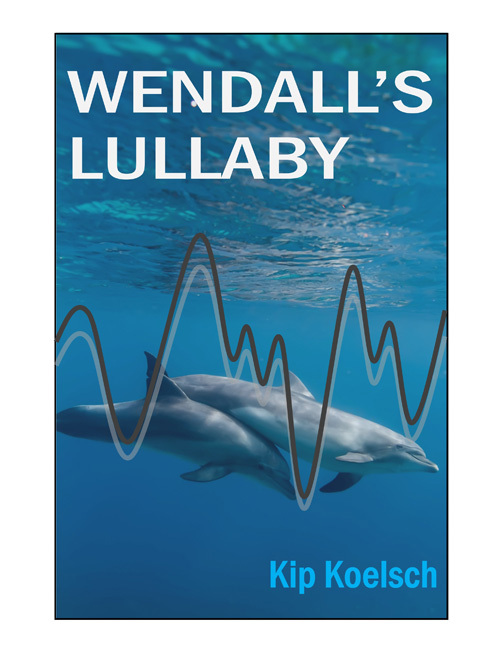 In Wendall’s Lullaby, hundreds of dolphins have mysteriously beached themselves in Galveston, Texas, and Dr. Angela Clarke is on mission to understand why. The US National Director for Marine Mammal Health and Stranding jets to Texas—unknowingly a pawn in the national security plans of THE FEW. An intimate group of former military men, THE FEW has infiltrated key positions within the government and orchestrated Dr. Clarke’s appointment—hoping her conservative, by-the-book approach will protect the top secret project a retired admiral sees as a lasting tribute to his dead son. When more animals hit the beach and an unusually large group of dolphins is spotted massing in the waters of Tampa Bay, Dr. Clarke must rely on an unconventional team—sorting through the ideas of her action-oriented South African beau, the conspiratorial rants of her ex-lover, the innocent insight of a 12-year old boy and the genius of a washed-out MIT grad student —in a race to save a charismatic species loved for its built-in smile. Wendall’s Lullaby may be Kip Koelsch’s first novel, but he wrote his first “books” in Mrs. Cook’s second grade class in Leonardo, NJ. Koelsch has an undergraduate degree in Journalism and Mass Media from Rutgers University in NJ and a Master’s Degree in Humanities and American Studies from the University of South Florida in Tampa, FL. Koelsch lives in Dunedin, FL, with his wife and four cats. Over the years, Koelsch has been a collegiate rowing coach, an adjunct professor in Environmental Studies, a “manatee watch” coordinator, a salesperson in two outdoor retail stores, a canoe guide, an outdoor fitness and adventure program coordinator and a trail running and triathlon race director. Through it all, he has been an on-again, off-again freelance magazine writer, blogger and keeper of a journal of “other writing ideas”—including the seeds for a follow-up to Wendall’s Lullaby and more works of fiction.